Gaya Tumuli is part of the Tentative list of Republic of Korea in order to qualify for inclusion in the World Heritage List. For this location I picked the Gimhae Daeseong-dong Tumuli due to easier map location, with Gimhae also being a rather large town instead of what appears to be in the middle of nowhere to find the other Haman Malisan Tumuli. Parking is just next to the large museum and the museum is entirely free! There is an information desk but the guy didn't speak anything but Korean so I just went ahead inside. The signs are available in Korean and English and are in great detail. I found out much more than expected. They also call this site as being "temporarily" listed as UNESCO rather than tentatively...interesting! Once you go through the museum you can freely walk on top of the actual tumuli, a large burial mound and reminiscent of the Viking ones in Scandinavia. At the start is a burial chamber you can look inside with a few signs but overall it is just a walk to stretch your legs, making that small ascend for a higher overview of the site, and then making your way down towards the parking lot if you are done here. Whereas the site is surely important for Korean history I'm not sure what they expect to see as unique value to the rest of the world. 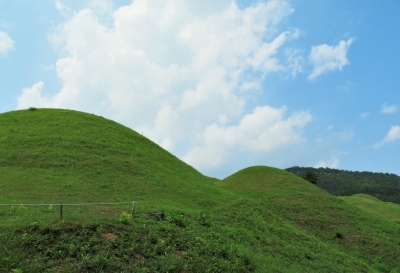 So far 704 tombs have been identified at Jisan-dong, dates range from 400 - 562 CE. The Gaya Confederacy was located between Baekje and Silla, and ultimately annexed by the later during the 6th century. Important elements of these tombs are its connection to human sacrifice, the largest evidence yet found in any single tomb site in Korea. In addition, there are numerous artifacts that originate from China, Japan, and the Okinawan islands. In fact, one tomb even contained Roman glass! During my visit to the numerous tumuli (tombs literally cover the hillsides), the Daegaya museum, and the Tomb 44 exhibition hall, I learned quite a lot about this ancient culture. Both similar, yet different from Silla and Baekje, I was surprised by the tremendous artifacts being unearthed just in the last couple years. Being in late June, the heat and humidity while climbing the steep trail to view the tombs was really a workout. The location is spectacular in both its view, but also the recognition of how many tombs there are here. 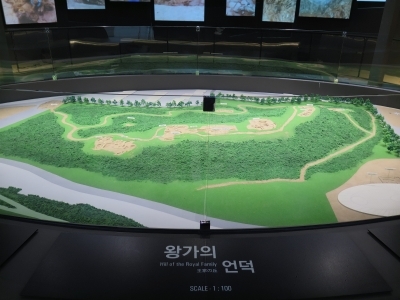 Keep in mind Goryeong is not too far from Haeinsa Temple, Dodong Seowon, and Upo Wetland. So if you are driving, it might prove to be an excellent region of Korea to explore. There is an interesting history connected to these tombs. Japan between the 1910's to 1940's spent significant resources in conducting archeological digs in Goryeong. Their purpose was to find evidence of a link between the Gaya Confederacy and the Yamato State in Japan. In their view Gaya must have been a military outpost of Yamato, but no evidence was ever discovered. In fact, archeologists today recognize that Gaya actually exported technology to Japan during this period. Part of the criteria for inscription is the role Gaya played in maritime trade and interchanges between other states in Northeast Asia. I found the Goryeong Daegaya site to be interesting and worth visiting. However, there are 2 Goguryeo Tomb WHS, 1 Baekje Tomb WHS, 1 Silla Tomb WHS, and 1 Joseon Tomb WHS. That means there are already 5 world heritage sites on the Korean Peninsula where the primary (or nearly so) justification for OUV is based on burial designs and rituals. Gaya culture is a little-known but important state during this period, not only for Korea, but also Japan. What ICOMOS will recommend is anyones guess, but we may know as early as 2021. I lean more toward regional importance instead of outstanding universal value, but I would not be surprised if it was inscribed. An excellent dossier, which seamlessly combines all Gaya Tumuli might go a long way to establish OUV. One unique bonus in visiting this site, upon entering the museum I received a free book about the Daegaya State and the tombs found in Goryeong. It's a real book, maybe around 200 pages, and it includes excellent photographs, information about the history, artifacts, archeological digs, and nomination.